At the Days Inn Antioch, we offer a variety of spacious and well-appointed rooms ranging from one queen, two queens, accessible rooms, and suites. Each guest room is equipped with complimentary WiFi, TV's with premium cable, complimentary movies, an alarm clock, AM/FM radio, a telephone, complimentary local calls, and a desk with an Ergonomic chair. Our non-smoking rooms also include a refrigerator and microwave, personal climate control, an iron and ironing board, complimentary local calls, and a coffee and tea maker. The private bathrooms include a hairdryer and complimentary signature toiletries. Our accessible guest rooms are fitted with closet rods that are at wheelchair height, telephone TDD, hand-held shower wands, bathtub grab bars, portable bathtub seats, and raised toilet seat with grab bars. Late check-out is available upon request. We have a 24 Hour Cancellation Policy. If you wish to cancel or modify a reservation, you must do so by 3 PM 24-hours or 1 day prior to your arrival date. If you cancel or modify after the expiration of the cancellation period, 3:00 PM or you fail to show up; a no-show charge will be levied on your credit card for one full night. Failure to call or show before check-out time after the first night of the reservation will result in the cancellation of the remainder of the reservation. 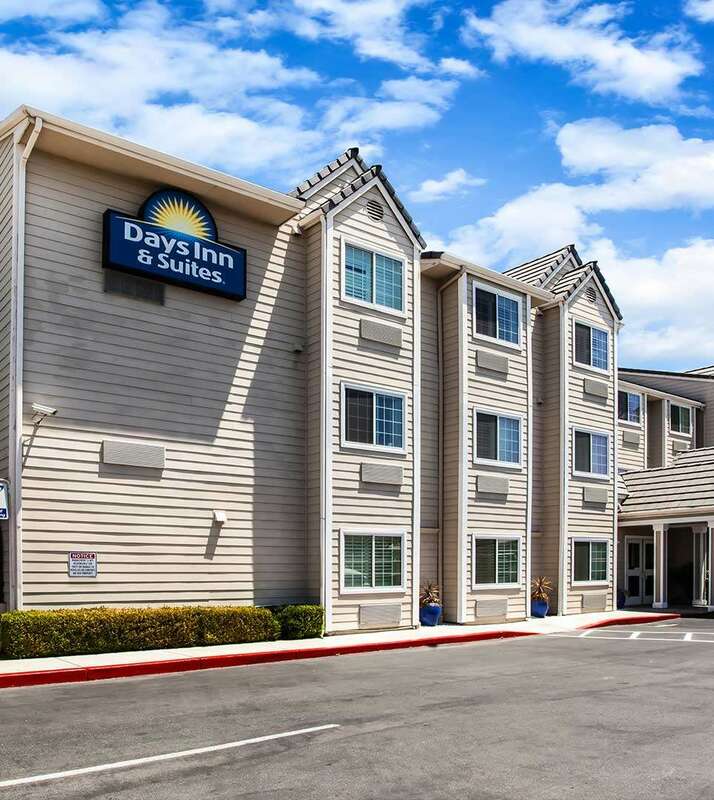 The Days Inn Antioch provides quick access to Contra Costa County shopping, attractions, popular restaurants, and area entertainment. We are near the Oakland International Airport, and a further drive from San Francisco International Airport, the San Jose International Airport. Other nearby public transportation includes Amtrak, and Bay Area Rapid Transit (BART). Days Inn Antioch provides a 100% smoke-free property for the comfort of all guests. Additionally, we offer our signature Daybreak continental breakfast, a 24-hour front desk staff, daily housekeeping, express check-in and check-out, as well as early check-in, and late check-out. We also provide a multi-lingual staff, laundry facilities, complimentary WiFi, and complimentary parking. For business travelers, we offer a meeting room and event space. Complimentary car, bus, truck, and RV parking is available for guests. One child under 5 years of age stays for free when using existing beds. Any additional children or adults are charged USD 15 per person per night when using existing beds. One older child is charged USD 15 PER night in an extra bed. Cribs or extra beds of any kind need to be confirmed by management. ADA Defined Service Animals are welcome at our hotel. Absolutely no pets not allowed. A pet sanitation fee may be charged at check-out if guest room shows that a pet has damaged the guestroom. Visa, MasterCard, American Express. This hotel reserves the right to pre-authorize credit cards prior to arrival. This property is privately owned, and the management reserves the right to refuse service to anyone and will not be responsible for accidents or injury to guests or for loss of money, jewelry or valuables of any kind. Once checked in, no cancellations. All linens are inventoried: missing or damaged linens will be charged. Any damages to hotel property will be charged an additional fee upon assessment. NO PETS ALLOWED. Guest rooms that have evidence of pet dander and/or odor will be charged a non-refundable fee for deep cleaning services. Any damages to hotel property will be charged an additional fee upon assessment. This is a NON-SMOKING facility. Guest acknowledges that smoking is not allowed in a guest room or within hotel facility. If anyone in the guest's party smokes in the guest room, guest hereby expressly authorizes hotel management to charge credit card the amount to reimburse the property for the additional cost of cleaning guest room. If your reservation has been paid in advance or you elect to pay by cash, a security deposit via credit card will be required upon check-in and will be charged in the event that damages outlined herein occur. A valid photo ID and credit card are both required at check-in. The hotel takes a credit preauthorization but does not accept cash deposits.